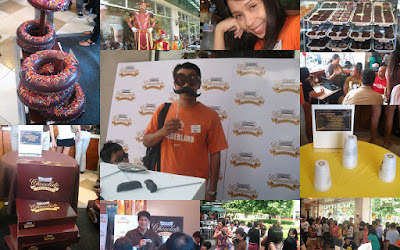 This morning, Jed, Jennie and I went to the launching of the Krispy Kreme Chocolate Karnival (www.chocolatekarnival.com). We arrived at exactly 11 AM and were fortunate enough to get a seat inside the cooler part of the shop, near the small stage for the program and near the production line of their donuts. We, especially my three-year old son, enjoyed the Krispy Kreme Chocolate Karnival because he was able to play some games like the Pachinko, cups stacking, box stacking and the doughnut ring toss. We went around to play the games and had our game passport stamped as we finished each game. After playing the game and naming the mascots of Krispy Kreme, we became eligible for a dozen Chocolate Glazed doughnuts. After the playing the games and getting stuffed with doughnuts, we witnessed the unveiling of the historic production of the Chocolate Glazed doughnuts, which are also come in different variations: the Chocolate Glazed Traditional Cake, Double Chocolate Cake, and the Chocolate Glazed (Strawberry, Rasberry, Custard, Kreme) Filled doughnuts. The Krispy Kreme Chocolate Karnival is tagged as the Greatest Chocholate Show on Earth. This melt-in-your-mouth doughnut offerings was kicked off by Krispy Kreme chairman Jim Fuentebella. 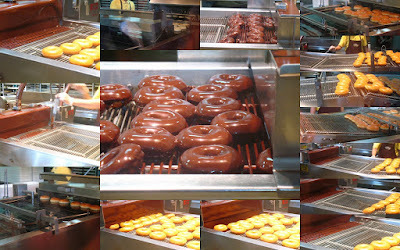 The introduction of the chocolate-y makeover of Krispy Kreme's Hot Original Glazed to the Philippines is a great step forward for Krispy Kreme and I think it will develop a great following in the Philippine market. It was truly a great experience for me and my family to have been invited to the launching of the Krispy Kreme Chocolate Karnival at Bonifacio High Street.